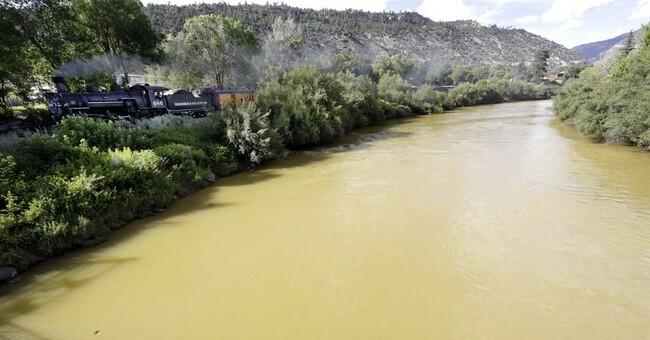 Durango, Colorado declared a state of emergency yesterday after the EPA accidentally contaminated a local river with 3 million gallons of waste. The Animas River has turned orange, and residents living along its banks have been warned to avoid it. The accident began Wednesday last week when EPA workers accidentally leaked a local mine, releasing concentrated minerals into a stream. The mine had been abandoned for about 10 years, and ground water had accumulated inside it. EPA workers were there to clean up the mine. Now, the mine is leaking at 500 gallons per minute. It still hasn't been contained, though workers are treating the nearby ponds where the minerals are leaking. The EPA has tested the polluted water and reports arsenic levels at 300 times the normal level, and lead levels at 3,500 times the normal level. Both arsenic and lead pose significant dangers to humans when highly concentrated. The local sheriff has warned local residents to stay away from the river. The contaminants move along the river fairly quickly, they will not completely pass until the mine leak is plugged. Many people who live along the Animas River depend on private wells for their water, but those are now threatened by the river's pollution. The EPA is sending materials to these residents so that they can test their well water for cleanness. Navajo Nation Council Speaker LoRenzo Bates told the Daily Times that residents were concerned about drinking water safety, river access, water for livestock and crops, and the possibility of compensation for failed crops. With irrigation canals shut off, many farmers are concerned about their next step, Bates said. "If these farmers don't get water in the next week, they'll lose their crops," he said. Mustard-colored water flowed this week into Cement Creek, a tributary that runs through Silverton [Colorado] and into the Animas River. In New Mexico, the plume of pollution entered Aztec early Saturday morning and Farmington later that morning. Officials said they expected it to reach the Utah border on Monday and Lake Powell, in Arizona, late Wednesday. "The magnitude of it, you can't even describe it," she said, CNN affiliate KRQE reported. "It's like when I flew over the fires, your mind sees something it's not ready or adjusted to see." "It's completely irresponsible for the EPA not to have informed New Mexico immediately."